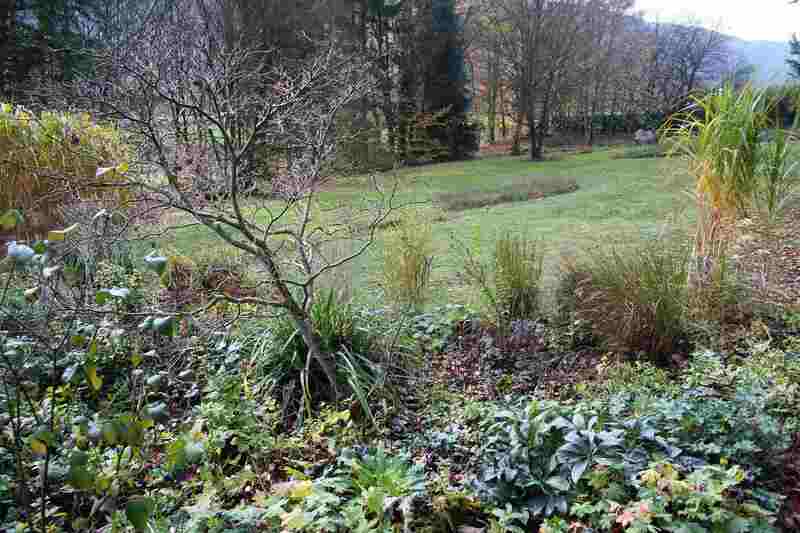 As you can see in the above photo I haven’t had the heart to trim this Perovskia yet, but the larger one on the other side of the rockery has been cut back to about 50 cm and will be trimmed hard again in spring. 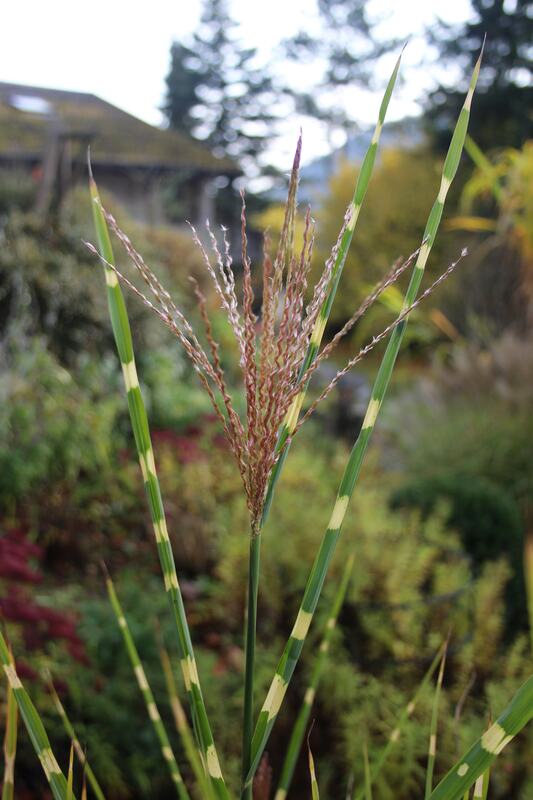 You may also notice an extra Calamagrostis has appeared in front of the Achillea support; planted out from a pot I had as a summer container, I am not sure I like it there but will mull over it for another week before replanting. Another awaits, and our new hole digger will be put to the test… watch this space! I must try and find the original label as there are various ones that look very similar. I just love these crimped seedheads! The last aster in flower is in the foreground here and there is still plenty of ground cover. The Hellebore leaves (on the right of the Acer) are looking very healthy, so let’s hope they remain so! If you would like to join me in posting a view of one part of your garden every Tuesday, please leave a link in the comments below! This entry was posted in Garden, Nature, Plants, Tuesday View and tagged Autumn, Garden, Seasons, The Tuesday View. Bookmark the permalink. Looking lovely! That zebra grass is particularly beautiful. Thanks Anca. I fear the garden is on the cusp of giving up now that we have such damp and cold weather. But I have been surprised many times in the past so we will see what November brings! 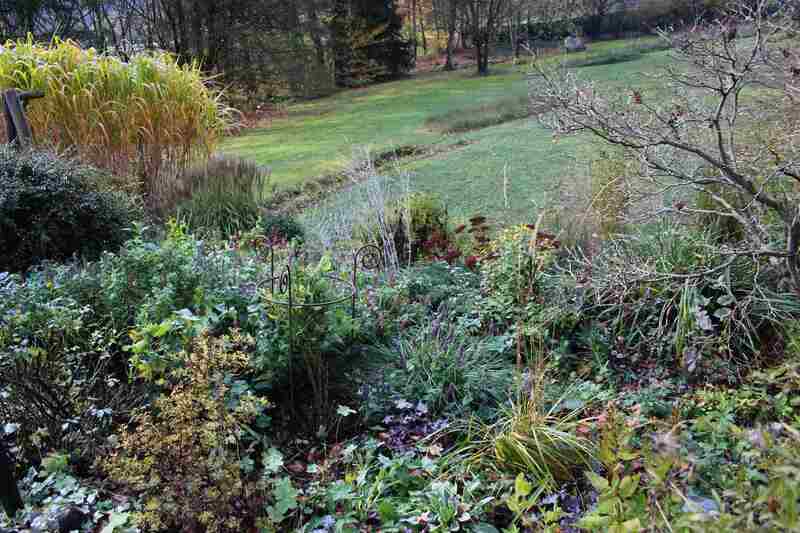 You didn’t mention the sedum – I love that deep burgundy. 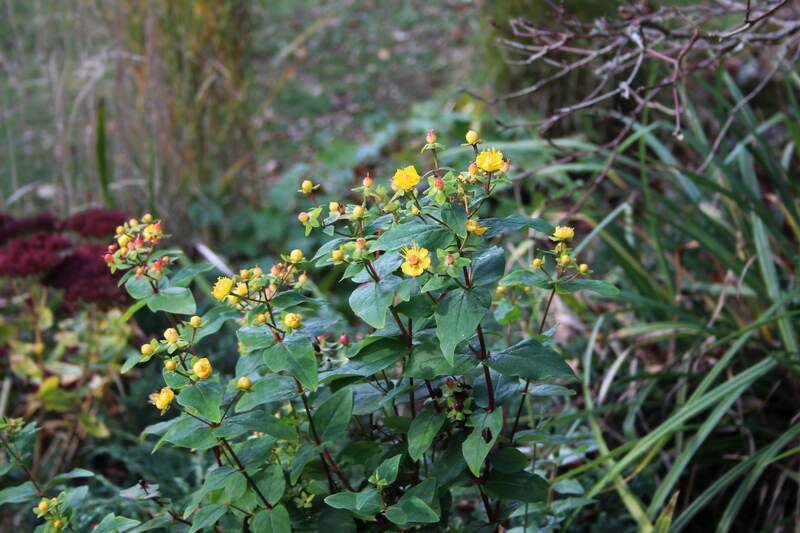 The asters and hypericum are impressively soldiering on! Interesting, mine dry on the stalk, so I leave them to catch snow. Eventually, the snow buries them, but they are eye-catching early in the season at least. Cathy I love how your garden is, adorable. 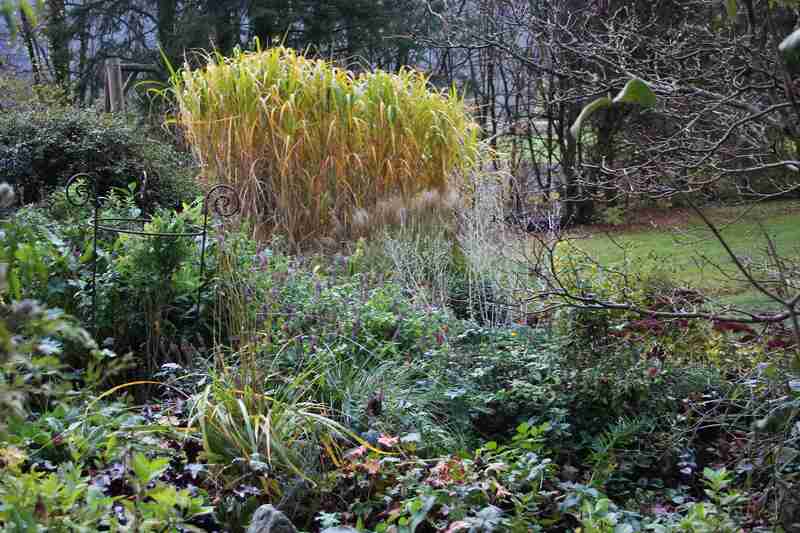 The giant Miscanthus is very beautiful as is the small one. The burgundy sedum is beautiful. I am no longer in my country house. I am in Madrid on my flat with my parents with many doctor appointments (some of them also for me) so I do not stop. I miss the country house and the garden. But I can see yours that is a delight. Greetings from Margarita. Thank you Margarita. Such a shame you cannot be in your country garden. I hope all goes well for you and your family. The green just isn’t quite as vibrant now, is it, Cathy! 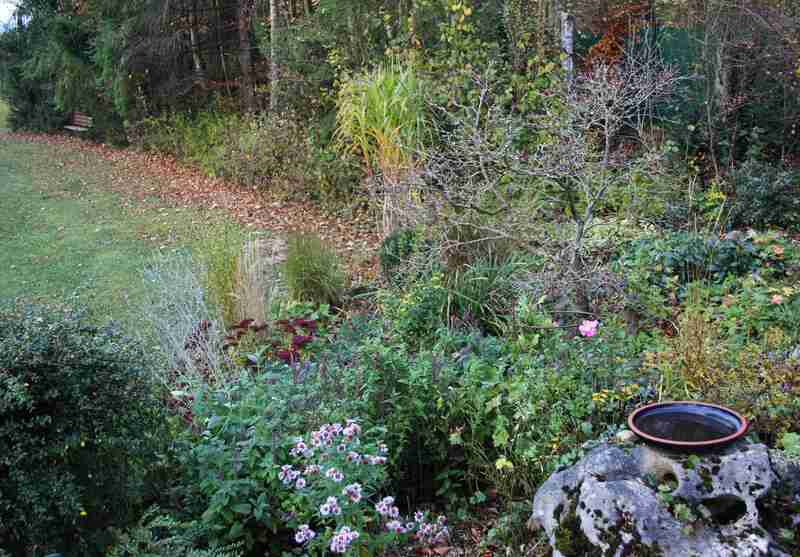 It is so interesting to watch a beautiful garden prepare for a little winter’s slumber! This time of year has its own beauty, but we need to have the eyes to see and appreciate it. I know you do! Glad to see your post on the Tuesday view, Cathy! The grasses in particular are looking superb and your views prove there’s so much to enjoy, even when the garden is going to sleep. Lovely also to see your rays of sunshine – Tuesday here was dank and particularly chilly. A real November day. Today it’s damp and chilly here too Cathy… I am glad November is a day shorter than the other months! So am I – my least favourite month! I have never seen an oriental poppy flowering so late here so you are having a mild autumn.